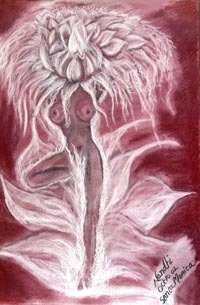 Each of these paintings have come alive through intense meditation. 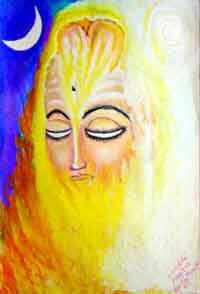 These paintings are the inner visions of the perfected beings of light, the Siddhar Gurus. 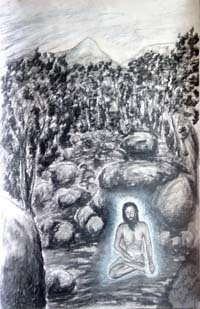 Tapasyogi Adiyen Nandhi was graced with the divine vision in Thiruvannamalai many years back. 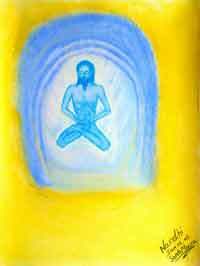 After years of deep meditative practice in the presence of realized Sages who live their lives meditating in caves and the wilderness of South India, he expresses the sacred joys of inner depth through these paintings. 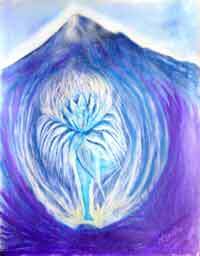 These paintings carry within them, the potent energies of the ancient lineage of Sages while they are painted in a meditative state as a gush of energy, within a short time. 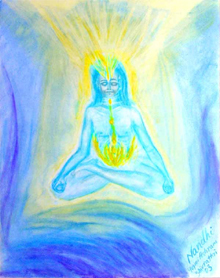 Taking visual form from higher wisdom of mantra vibrations, the resonant energies behind the sound converges as the inner light, hence the name for this art gallery, “Visions Beyond Enlightenment”. Nandhi’s journey into the mystical realms of the Siddhars began about 2 decades ago after a near-death experience that was an initiation. 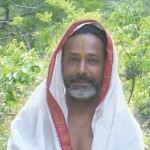 He took a plunge into the ‘other’ India to seek the intense ancient yogic wisdom. 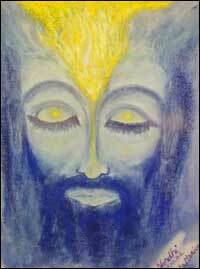 Nandhi expresses the meditative secrets, the grace of the masters of higher consciousness and the blessings of the Sages through this art. Plak: Ready to hang, mounted on wood, weather proof, textured finish on 1 inch box frame. 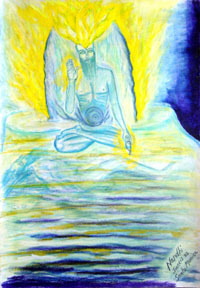 Therefore the yogi’s meditate in a dark mountain cave. In the lap of boundless dark, on Mahanirvanas waves upborne, peace flows serene and inexhaustible. Who art Thou, Mother, seated alone in the shrine of samadhi? Thiruvannamalai is the most ancient spiritual center of South India with this sacred mountain called by the sages, the mountain of fire. This painting of Thiruvannamalai is a feeble attempt to capture such an immense experience of the two eyes which the third eye when aware is the witness as pure bliss! 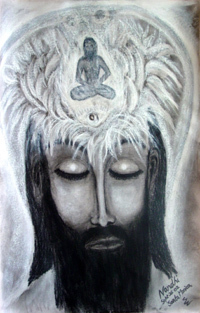 Experience Lord Siva through the mantras: see Video! The Eternal Fire of the Heart Cave! 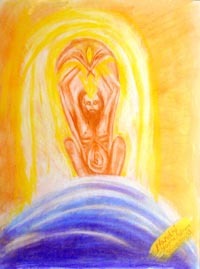 The “Knowing” Beyond Death & Birth! 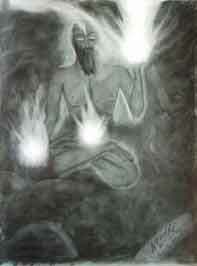 Supreme Guru of Ancient Perfection! Wisdom in the Ocean of Breathlesness! 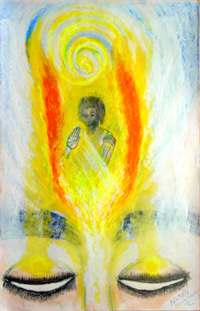 He was transformed, glowing and radiant. 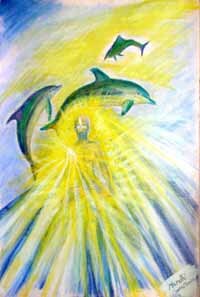 He said that He was taken to the depth of the ocean by the divine beings and here He was imparted the sacred wisdom. Divine Grace of Guidance & Teachings! Grace of the Golden Body! He, the mighty one of white moon crest. 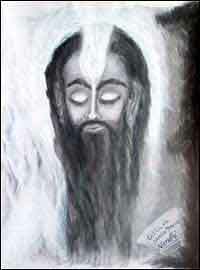 Divine Master of Eternal Youth! 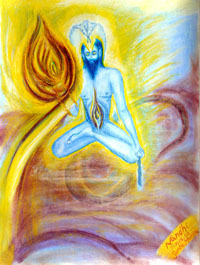 Journey with Maha Avatar Babaji: see Video! ascend above to be Siva. Sage of the Six Pointed Star Yantra! Destruction of Ego and Negativity! Cut free Becoming the lamp above the navel As Shakthi, She is the joyful mother of the yogin In the pleasure realms of seedless bliss, Detached, the enlightened sing of Maha Kali! 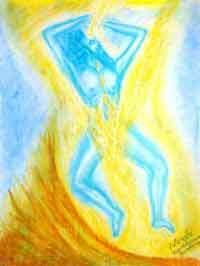 True tantra, in grace, as love She lets be! Him merged as Her in surrender. 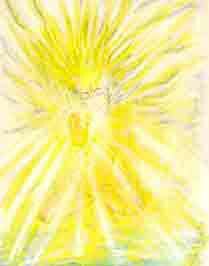 The Light Which Burns Karma, Heals, Guides and Protects! 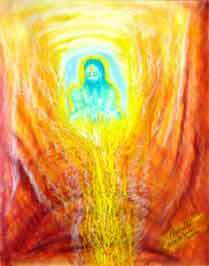 The Guru’s presence is like light taking over darkness and millions of years of evolution then transforms the sacred life within us to recognize the ‘supreme joy’ as that of union with the divine. The high quality print is professionally mounted to wood with dry-mount tissue and heat-pressed. A special UV protective vinyl is laminated over the print and heat-pressed again under 120 tons of pressure. The edges of the wood are beveled, sanded and trimmed. There’s no annoying glare. The plak’s vinyl surface makes images clearer to see and easier to read from any angle. There’s no breakable glass. With the plak’s unique 80% UV protective vinyl surface, grease, dust and moisture wipe right off! Compare the cost of plak with custom picture framing. The plak is an excellent value! Create huge dharma with your space. 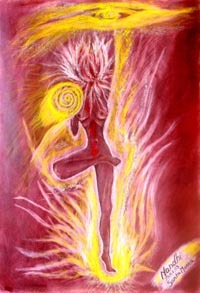 Check this page on Sensitive Planet, The Enlightening Market Place! 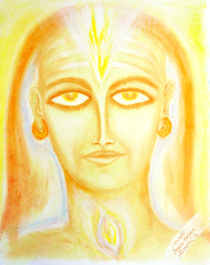 Get a free painting print of your choice with a purchase of “SivaSivaa” a meditative journey of initiation and teachings with Nandhi! Raise your Consciousness with Turiya Nada – Cave of the Siddhars: Conscious Multimedia Database applies Dr. David Hawkins’ revolutionary conscious calibrations through the use of applied kinesiology. 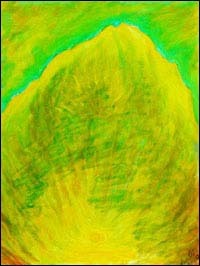 According to Dr. Hawkins’ Map of Consciousness, Cave of the Siddhars calibrates in between 1000 and 1250. 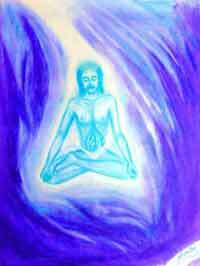 This is the level of Christ, Buddhahood, Krishna and Brahman. Out of over 250Cds featured by cmmdb.com , Turiya Nada “Cave of the Siddhars” is featured the highest.